This interesting surname is of Anglo-Saxon origin, and is a topographical name for someone who lived in a nook or hollow, deriving from the Olde English pre 7th Century "halh" a nook, hollow, recess. In northern England the word often has a specialized meaning, denoting a piece of flat alluvial land by the side of a river, originally one deposited in a bend; in the south-east it seems often to have referred to a patch of dry land in a fen. In some cases the surname may be a locational name from any of the several places in England named with this archaic form. The surname is first recorded in the latter half of the 12th Century (see below). Robert Attehal' is noted in the Curia Regis Rolls of Lincolnshire (1212) and Morus de la Hale is listed in the Curia Regis Rolls of Kent (1214). 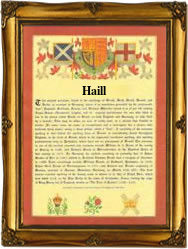 Variations in the spelling of the surname range from Hale, Haile and Hele to Hayles and Hailes. One of the earliest settlers in the New World was John Hales, aged 21 yrs., who departed from the port of London aboard the "Assurance" bound for Virginia in July 1635. This illustrious family have had no less than twenty Coats of Arms granted to them, and the name is recorded twelve times in the Dictionary of National Biography. The first recorded spelling of the family name is shown to be that of William de Hales, which was dated 1180, in the "Pipe Rolls of Shropshire", during the reign of King Henry 11, "The Builder of Churches", 1154-1189. Surnames became necessary when governments introduced personal taxation. In England this was known as Poll Tax. Throughout the centuries, surnames in every country have continued to "develop" often leading to astonishing variants of the original spelling.